Texting While Driving is Against the Law in Georgia! Texting while driving is a deadly practice that has become the number one driving distraction for many people. Texting on a wireless telecommunications device while operating a vehicle is prohibited in Georgia. That means no reading, typing or sending text messages. Drivers are not permitted to touch the keypad or look at the text screen. The law applies to all drivers, regardless of age, driving on public roads and highways. Even those stopped at a red light, or waiting in a turn lane. If you text and drive, you're 23 times more likely to have a car crash, according to a study on driver distractions conducted by Virginia Tech Transportation Institute. Of all the distractions measured in the study, text messaging had the longest duration of "eyes off the road". With an average distraction time of 4.6 seconds over a 6 second interval, that is like driving the length of an entire football field at 55 miles per hour without ever looking at the road! 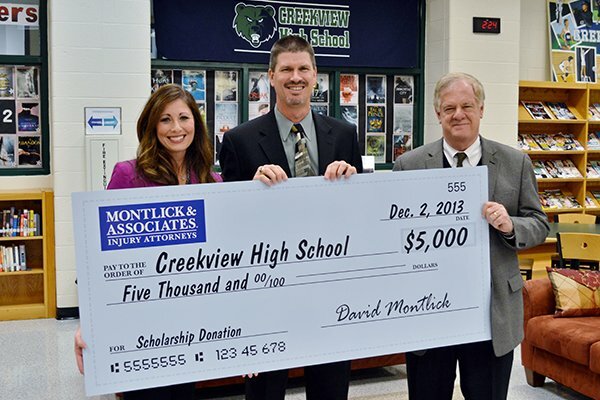 Since 2009, Montlick & Associates has been making an effort to help reduce the number of injuries caused by people texting and driving. That effort includes "Don't Text & Drive" campaigns, billboards and public service messages on television throughout Georgia. Our safety initiatives are supported by partners in the Atlanta community such as The Safe America Foundation, Fox 5-Atlanta and WSB-TV. Our safety campaigns are meant to encourage, enlighten and educate everyone, so that we can all stay safe on the road. 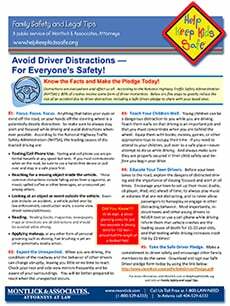 Montlick & Associates proudly partners with Atlanta's Fox 5 and The Safe America Foundation to encourage teens to take the "Safe Driver Pledge". 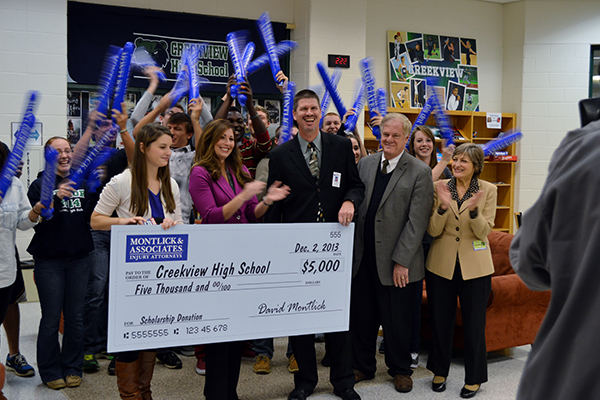 The high school with the most pledges receives a $5,000 donation from Montlick & Associates. 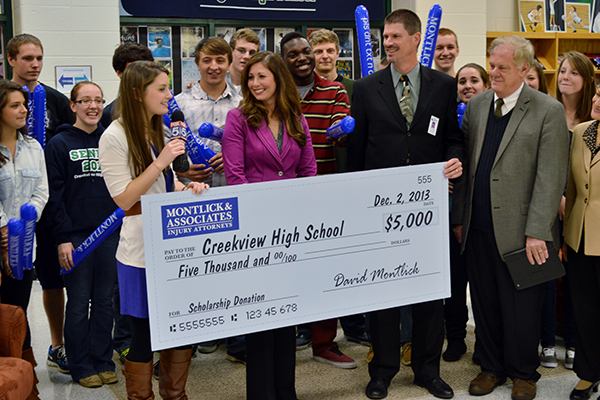 In 2013, Creekview High School received a $5,000 check for winning the High 5 Sports and Montlick & Associates "Don't Text and Drive" campaign. 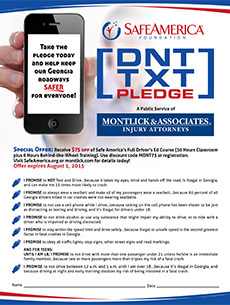 Montlick & Associates is proud to support Channel 2's Wait 2 Text Program. The campaign is a station wide initiative comprised of television messages that help raise awareness of the dangers of texting while driving. The campaign ends with a prime time special that expands on the dangers of distracted driving and the laws, programs and technology in place to prevent drivers from texting while driving. Montlick & Associates has also created a number of video that can be seen on Channel 2's noon news, featuring Montlick & Associates' Family Safety Advocate Jacquie Palisi. The 2-minute "Daily 2" Segments promote safety and injury prevention, including education about the dangers of texting while driving and driver distractions. "Please Don't Text & Drive"